The urge to tidiness seems to be rooted deep in the human psyche. Many of us feel threatened by anything that is vague, unplanned, scattered around or hard to describe. We find comfort in having a script to rely on, a system to follow, in being able to categorise and file away. We all benefit from tidy organisation - up to a point. A large library needs a reference system. Global trade needs the shipping container. Scientific collaboration needs measurement units. But the forces of tidiness have marched too far. Corporate middle managers and government bureaucrats have long tended to insist that everything must have a label, a number and a logical place in a logical system. Now that they are armed with computers and serial numbers, there is little to hold this tidy-mindedness in check. It's even spilling into our personal lives, as we corral our children into sanitised play areas or entrust our quest for love to the soulless algorithms of dating websites. Order is imposed when chaos would be more productive. Or if not chaos, then . . . messiness. The trouble with tidiness is that, in excess, it becomes rigid, fragile and sterile. 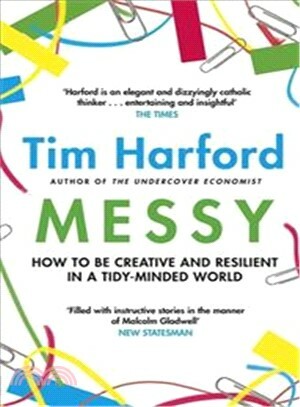 In Messy, Tim Harford reveals how qualities we value more than ever - responsiveness, resilience and creativity - simply cannot be disentangled from the messy soil that produces them. This, then, is a book about the benefits of being messy: messy in our private lives; messy in the office, with piles of paper on the desk and unread spreadsheets; messy in the recording studio, the laboratory or in preparing for an important presentation; and messy in our approach to business, politics and economics, leaving things vague, diverse and uncomfortably made-up-on-the-spot. It's time to rediscover the benefits of a little mess.